Amazing Green Tea's Dragon Well 2008. I must admit that I love both high grade Dragon Well teas. Having tasted several types of Dragon Well teas, I have mostly been disappointed. Last year I found out that Amazing Green Tea sold some Dragon Well teas, and when I tasted both he Jipin and AAA grades, I was thrilled! 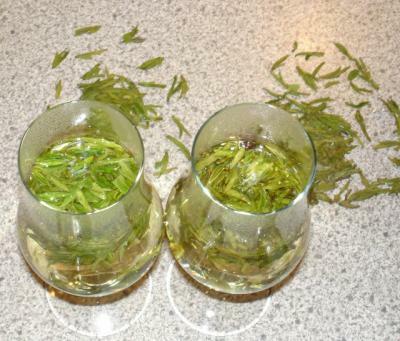 Having been out of Dragon well teas for the winter, I was a first a bit disappointed that the harvest was late. But thinking about how wine graphs should develop slowly to reach their best, I secretly hoped that Dragon Well tea would do the same and benefits from a slow "ripening" and thus a late harvest. Julian indicates that the teas can be even better if let to mature for some months, but I cannot wait until June to drink them. Dragon Well tea is my favorite tea, and to receive the tea directly after harvest is like Christmas to children. Before writing this little review, I used two 10 grams King Grade and a large bag of Jipin grade for learning, trying to optimise water temperature and brewing times. Between each sip or taste, a small piece of non flavoured white bread was eaten. This I do to minimise the influence one tea has over the other. This is the same way I do when doing wine tastings. Colour of the leaves/buds are more green for King, and more light brown for the JiPin. Jipin has also more broken leaves and small leaves compared to the King where the leaves/buds are intact. Smell of dry leaves is an amalgam of hip and algae, and a slightly fresh scent of flowers. King grade has more powerful aromas. It is a love smell! Eating the dry leaves/buds has a special sensation. They crack in the mouth and a cascade of aromas and tastes. Like eating fried frog legs (or potato chips). The King Grade is a delight to eat. The Jipin is slightly bitter to the taste. Like fine chocolate but a bit too bitter for my taste. The King grade is not as bitter and I favour that one. I used wine tasting glasses. Brewing times: 1, 2, 4 minutes. Water was reheated between brewing. Almost boiling water was used for both teas. Water here in Stockholm comes from the lake Maalaren and is soft. Amount of tea leaves used was about 3-4 grams (A 10 gram King grade bag lasts for 3 sessions, ie about 9 cups of tea). Water used was 1.5 dl. I do not use the "traditional" method of 2/3rds but empty the glass completely before doing the next brewing. Watching the buds and leaves slowly sink down to the bottom of the glass is like watching a little water ballet dance. Like in ultrapid they fall to the bottom. But not all at the same time. Like if they had some form of que order. I noticed that the King grade buds and leaves sink faster than the ones from the Jipin grade. Maybe this has to do with how much oil was used during frying the tea. Taste is sweet and full-bodied with a nice oily touch that I like so much. The oily touch is strongest for the first brewing and decreases for each next brewing. Instead of the oily taste, the 2nd and 3rd brews have more of a nature made taste that is much lighter on the tongue. Still sweet, though. Jipin is more oily than the King grade. Aftertaste is the loooooongest I have ever tasted! Easily half an hour! Smell is fresh without any form of bad smells to it. The aroma is kept well inside wine tasting glasses, and a swirl or two with the tea makes the aromas concentrate inside the glass. A quick but strong inhalation reveals mushrooms, algae, and hips. This is how best of the best Dragon Well tea should smell in my opinion. Not thinking about the price, I ask myself which one is the best then? Which one to buy? It is not that easy to say. I must conclude that both are best as they both have many strong points - that although they differ slightly. I cannot say that one is better tasting than the other. Instead I say that they are both needed in a tea afficionado's cupboard. Both belong to the top of the class and are teas one should no miss 2008! When you buy the King grade, do buy a few bags as you need to learn how the King grade is to optimally be brewed. Just one bag will not let you extract the best from this tea. Thinking about the price, I ask myself are these Dragon Well teas worth the money? Stupid question, actually, as they are worth every penny in my opinion.